Libbi Gorr interviewed Professor Lindsay Oades for her ABC Radio Melbourne show on Sunday 18th November. To listen visit https://www.abc.net.au/radio/melbourne/programs/sundays/sundays/10486646 @ 1h 35m. The Wiley Blackwell Handbook of the Psychology of Positivity and Strengths-Based Approaches at Work. Edited by Lindsay G. Oades, Michael Steger, Antonella Delle Fave, and Jonathan Passmore. Click here to find out more. 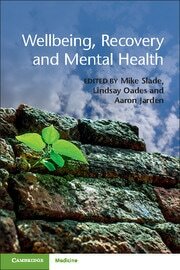 Wellbeing, Recovery and Mental Health. Edited by Mike Slade, Lindsay Oades and Aaron Jarden. Click here to find out more.